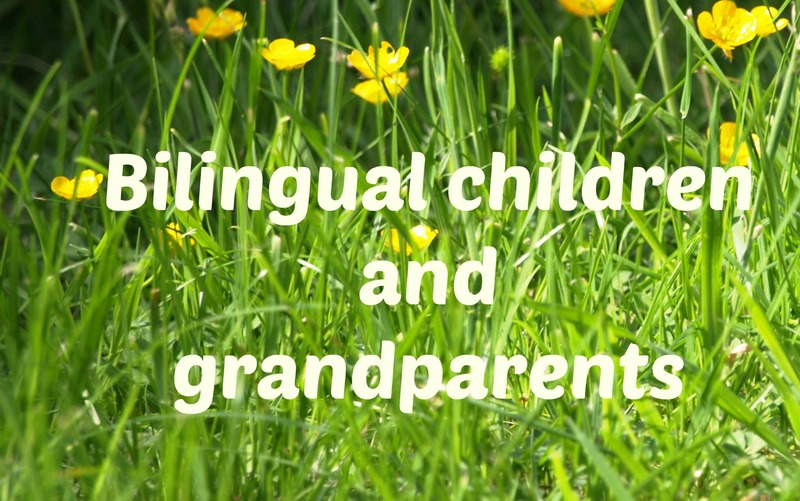 Today’s post about bilingual children and grandparents was partly inspired by some of the great ideas my fellow bloggers had around the topic “How technology can help you bring up a bilingual child”, which was the May edition of the Raising Multilingual Children Blogging Carnival. When my daughters were small I remember often wishing that we would have lived closer to their grandparents so that my girls could have spent more time with them and at the same time to get more exposure to their minority languages – this was in the time before Skype, Google hangouts, FaceTime and video phone calls. Children often have a very special bond with their grandmothers and -fathers. The grandparents are like parents but without as many rules and with plenty of time and a lot more patience. Grandparents are also in the centre of the extended family, teaching their grandchildren about their heritage and family history. It is important for children to be around the older generation – it teaches them to be respectful and gives them a greater understanding of the world and how it is changing. To be able to explain something to your granny, you have to share a common language with her – to me, children being able to communicate with their grandparents is one of the key reasons why I am such a strong advocate of passing on the family languages. A common language bridges across generational and cultural borders. For many multilingual families it is a fact of life that at least one set of grandparents live far away and can be visited in person maybe once a year at the best of times. Modern technology has however made it so much easier to stay in touch, and it helps to create and maintain a close relationship between children and their grandparents. Connecting over the internet can help in many ways. Grandparents can entertain the other kids by reading them a story while the new baby is being bathed and put to bed – virtual baby-sitting (as described by Galina)! Or they can be there for teenagers when they come home from school, as in Annika’s case. It is good for kids to have time on their own with the grandparents, as there are those things children might be reluctant to speak to their parents about, but are happy to share with grandma or grandpa on the other side of the world. Especially if you are a the minority language parent, these calls are so important as your children will get a more varied exposure to your language. If you haven’t made such calls a part of your family life, I suggest you start by scheduling them in at a suitable time. By initially setting up an agreed schedule these calls are more likely to become an eagerly anticipated routine. With all the blessings technology has brought with it for families that live apart from the extended family, let’s not forget good old letters! Snail-mail still exists, and letter-writing is a great way to exercise writing skills for children. Not to mention the joy of receiving a letter! And if there are no grandparents for the children to stay in touch with? How to arrange for a similar rewarding relationship with someone from another generation? Maybe there is another relative who would like to step in, or a family friend. Check if your community arranges “Adopt a Grandparent” type of initiatives – if not, why not suggest they do? Great post! My children are very lucky to have minority language grandparents and extended family involved and devoted to the process of their language aquisition and development. Sometimes nothing will cheer up my 4-year old as telling him to Skype with grandma. I really like the idea about engaging with lonely elderly in retirement homes!